A mirror-cut Aquamarine from Brazil with lots of internal life. The cracks makes a lot of sparkles, very fine colour. 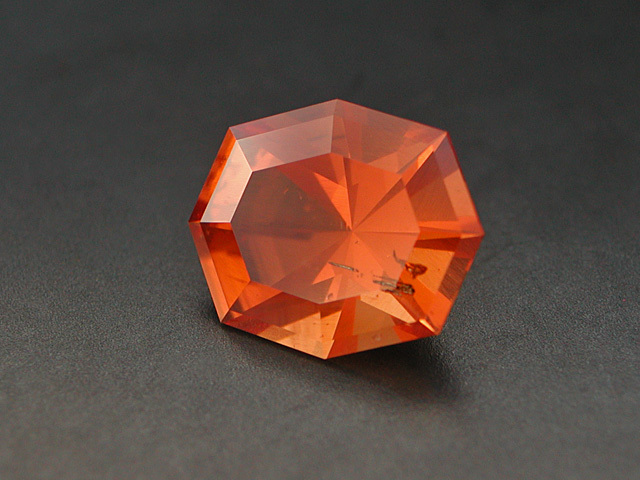 1.78 cts., 7.2 x 5.2 mm. Yes, you´re right this is a tiny gem. When I bought the rough with 4.45 cts. I hoped to have a result slightly over one carat. Not visible was a crack at the place of the pavillions tip. So I had to cut and cut and it became smaller and smaller. All the trouble zones with inclusions and cracks left and it became smaller and smaller, but I was not willing to give it up. The result is an outstanding, flawless little gem with 100% meetpoints, great vivid colour and just enough colourzoning to show its natural origin. 0.44 cts., 4.1 x 4.1 x 2.9 mm. Chrysocolla in Chalcedony with lots of pure copper. 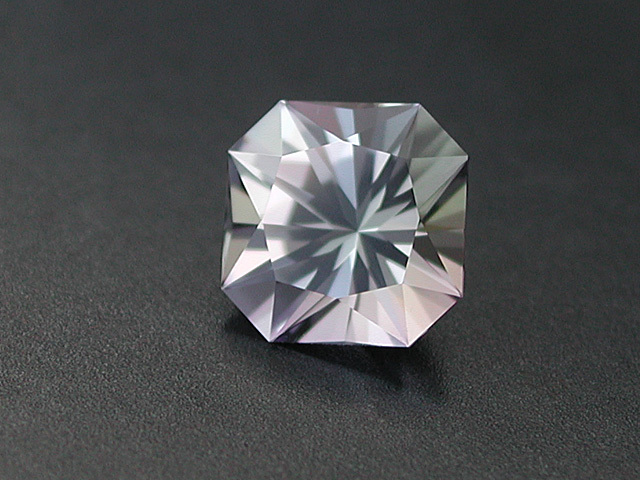 52.94 cts., 31.0 x 7.1 mm. My madagascar-dealer surprised me this summer with a lot of Spessartines from Ejeda. I didn´t knew that Madagascar also has orange coloured Spessartines. Maybe not the same type of colour as Mandarin-Garnets used to have but the internals with some horsetail like inclusions reminds me on the very few ones from Namibia. 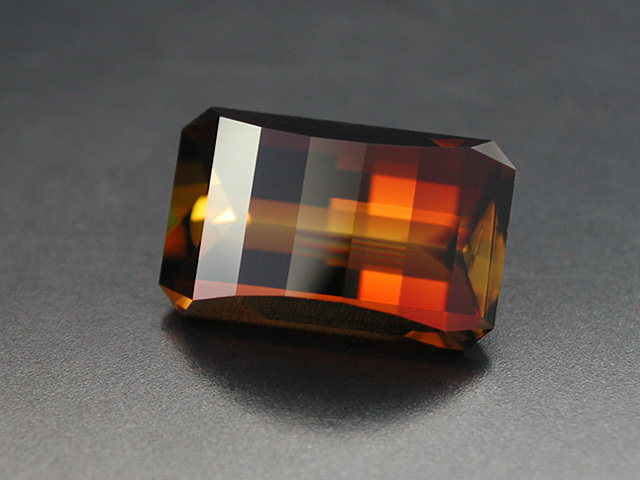 Cool stuff with very unusual colour, a fine addition for garnet lovers! Pipistrelli Girasol-Quartz from Madagascar, clean (with some silk) and brilliant. very saturated magenta red colour, near eyeclean (that is very unusual for the Marolambos!). there is a small crack in one corner that didn´t worked out, it might be hidden by a prong if set. This will be one of my last bigger Hydro-Grossulars if my dealer don´t get any new ones from Sibiria. A silky yellowish-green colour that even lets surmise the pavilion facets gives it a nice glowing appearance. Extremely saturated magenta pink Mahenge Garnet. Really hard to catch fine roughs in this size. 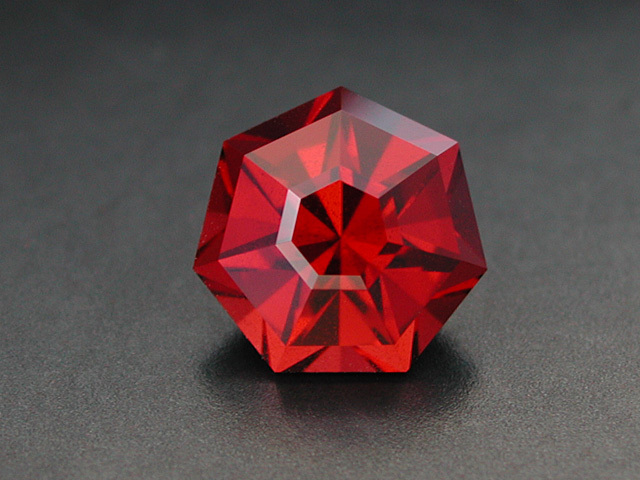 And no question these rare Garnets are expensive even if it has some internals like this one. But hey the colour is unbelievable and shifts a bit from magenta red in incandescent to more pinkish in fluoro light. Nice coloured afghani Tourmaline in my Trinity-design with only 17 facets and its triple sunburst pattern. Flawless clarity, c-axis colour. 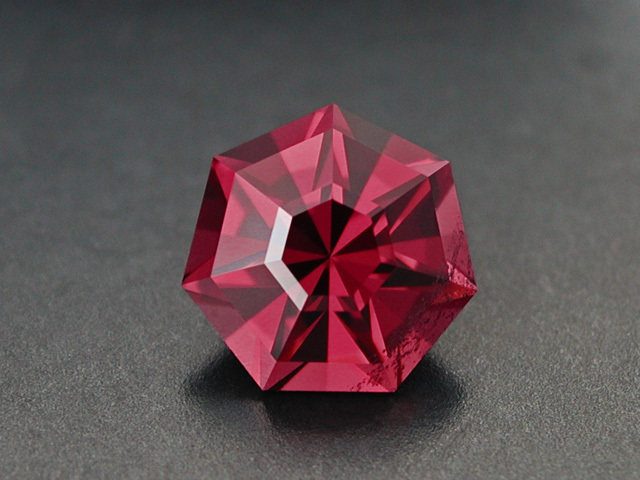 This rare member of the garnet family was found in Erongo, Namibia. 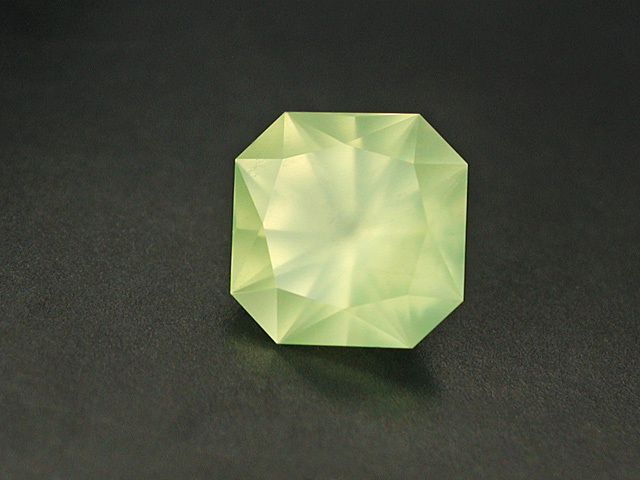 The daylight-colour reminds a little of peridot, while incandescent light turns the colour more to yellowish green. The dispersion sparkles are unbelievable in this only very lightly included (near eyeclean) gem. Custom Cut. I´m always searching for fine Tanzanites even in the more rare colours. And the Savannah-Tanzanites are with no question my favorites. Extremely hard to get after most roughs are routinely heated to receive the beautiful purplish blue colour. There is a small crack, not noticable in the pic but existent so it would be a high risk to set it. Better enjoy it in your collection! 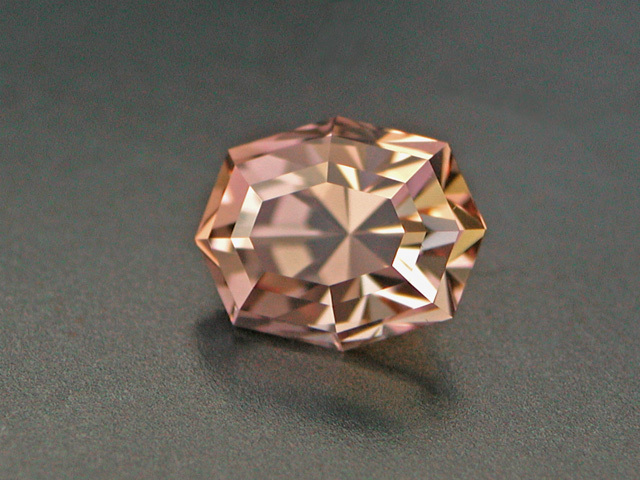 There is a slightly colour-shift in most Savannah Tanzanites, the daylight colour is the best with a little more pink colour. Very saturated and dark (but not too dark!) 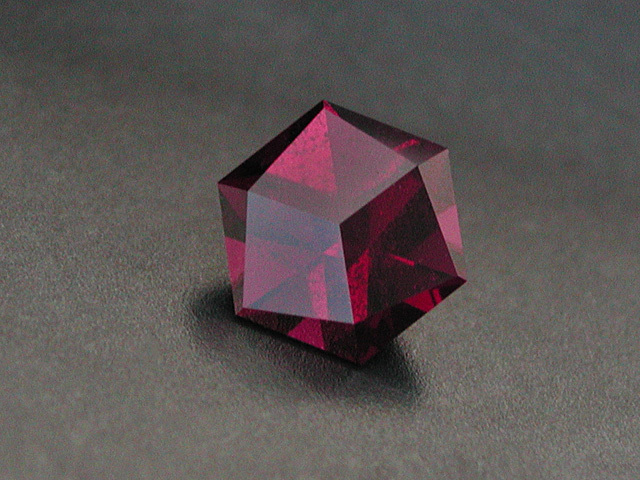 Rhodolite from Marolambo in Madagascar. There are some internals visible - also for the naked eye - but not too prominent. My stock of bigger Fire Opals from Juniper Ridge, Oregon is running out. This is a fine example of this stuff with nice colour, not too much silk and really big size! The "Pelegrinsche Drachen" is even in silky gems a well performing design. Very big Tanzanian Dravite (Tourmaline Group) in orange, cola and grenish yellow colours with strong dichroism. 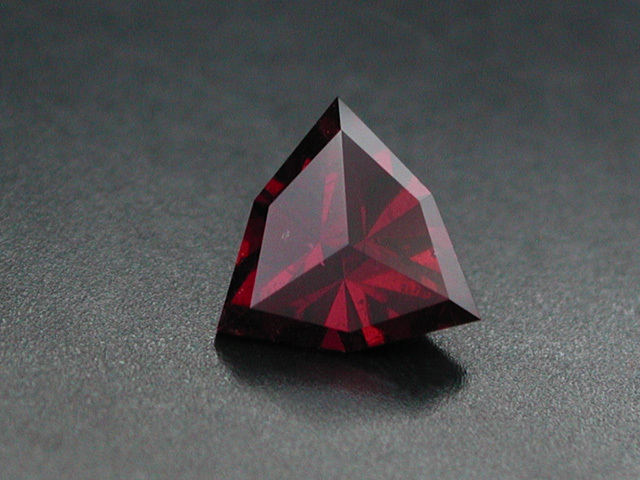 Dark red Almandine from Bechtel Butte in Idaho, USA. This is a very pure Almandine that can easily be lifted by a neodynium magnet. It also shows a good colourshift from violetish red in incandescent light to purplish red in day- or fluorolight. Also the pointed version of the "Pipistrelli". Some not eye-visible internals. 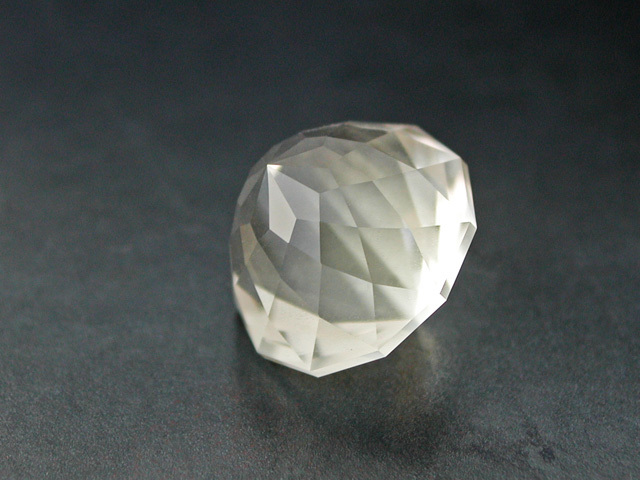 Same kind of gem like the above one and similar design. Here it is the "Pipistrelli" in the hexagonal version. 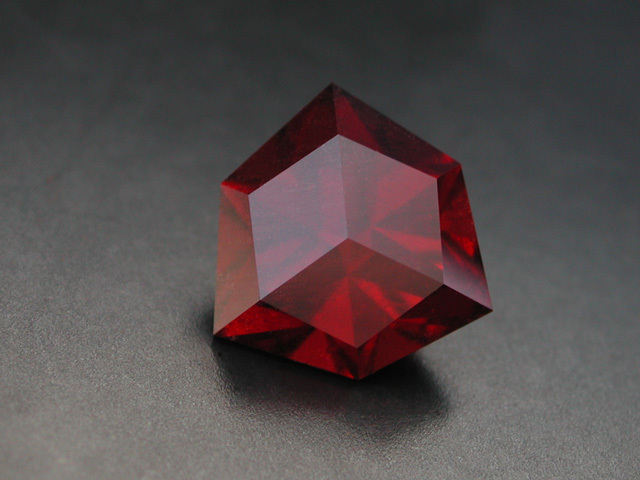 Also dark red Almandine from Bechtel Butte in Idaho, USA. This is a very pure Almandine that can easily be lifted by a neodynium magnet. It also shows a good colourshift from violetish red in incandescent light to purplish red in day- or fluorolight. Some not eye-visible internals. 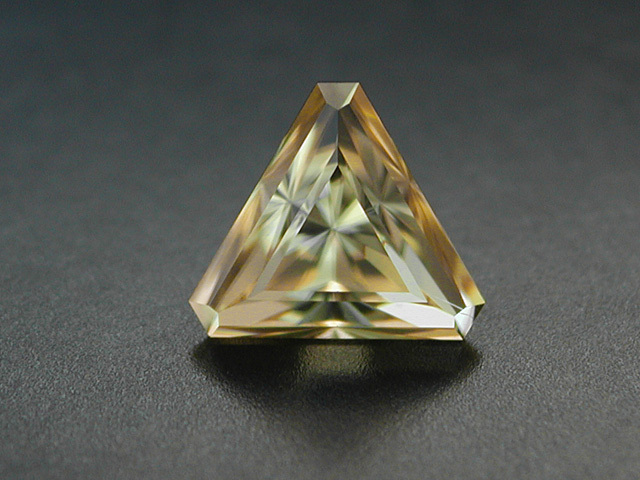 Finest brazil Citrine in Marco Voltolinis "Markoh-i-noor" with 152 facets. Flawless stuff from a new Idar-Oberstein dealer, bought last year at the Munich Show. 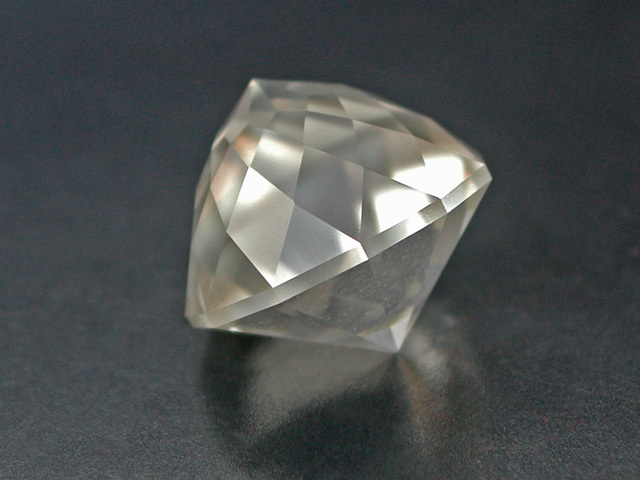 Light champagner coloured Moonstone from Tanzania. There is a soft mystical shiller rolling over the hich dome crown. 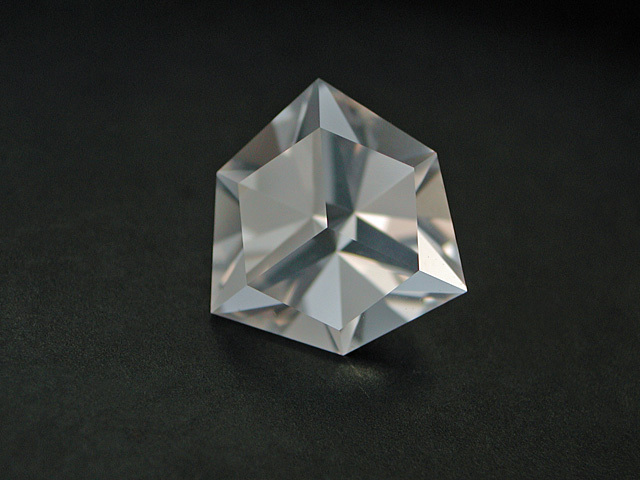 I´m working on some different designs of the kohinoor-type and this one works on a 11facets-base. Another natural (means untreated) Tanzanite that has escaped from being heated. So the colour is soft and trichroitic with bluish purple, light violet and some green aspects. Ezbar Square design with its superflat table.